The Black and White Cookie Company, traditional New York City Black and White Cookies. As the end of another school year approaches, for many students, graduation does too. Whether it is high school, college or graduate school, each graduation deserves a special celebration. A treat that will appeal to every graduate and their family is our delicious black and white cookies. Congratulations to all of the 2013 graduates! When it comes to planning your wedding, one of the biggest decisions to make is the food. How will you choose dishes that will appeal to the most people? According to an article by WCSH6 Portland, April is right in the middle of wedding planning season, which started on February 15 and goes until the end of May. As you’re planning your big day, make sure to consider choosing The Black and White Cookie Company for your dessert options. Congratulations Cindy Webster and her husband on their recent wedding in California! Thank you for submitting the beautiful photo including your lovely display of our black and white cookies. An excellent combination of sophistication and sweetness, half moons can add elegance to any wedding. As a kosher cookie, it can also be served and enjoyed by all who eat it. 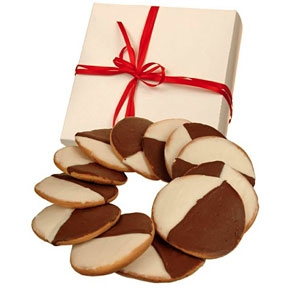 The Black and White Cookie Company wants to hear your favorite memories enjoying these classic half moons. Tell us your stories on the blog or tweet at us. We want to share Mike’s story today. He has a special childhood memory with a beloved family member, which has stayed with him even as an adult. For Mike, a New York state native, he distinctly remembers when his grandmother would take him to the White Eagle Bakery. Don’t forget to buy your black and white cookies and share with a friend or relative. Free Shipping: Order Now! Mike, having any choice of his favorite treat to choose from, would always pick the black and white cookie. This soft and deliciously-sweet cookie would be eaten by Mike as he broke the cookie down the middle, eating the vanilla side first, and finishing the cookie by enjoying the chocolate side last. To this day, Mike still eats his half moon cookies the same way and loves every bite. Share with us your favorite black and white cookie moment with us on Twitter or Facebook! Through the eyes of a child, eating a black and white cookie is an art. Miss Kathy advises that there are certain steps one must follow to truly enjoy a half moon cookie, like picking your favorite side of the cookie first. It’s tough choosing between that rich, chocolatey black side and that sweet, vanilla white side, but it is a vital step that must be taken. Once a favorite side has been chosen, it must be saved for last. For Kathy, the vanilla side is her favorite, so the chocolate side must be eaten first saving the best for last. Order your black and white cookies today and receive free shipping! The Black and White Cookie Company http://www.blackandwhitecookies.com. Awesome Inc. theme. Powered by Blogger.